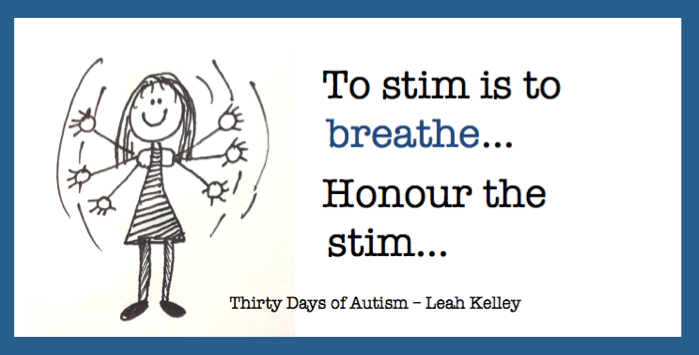 This entry was posted in acceptance, Autism, Autism Poem, Loud Hands, poem, poetry, stim and tagged honour the stim, Small but Kinda Mighty, socially appropriate, stim, Stim. Musing of an Aspie. Bookmark the permalink. I was actually working on this today prior to reading your post. Sometimes we just seem to align so perfectly and I couldn’t resist – it just fit my thinking and I love LOVE your perfect acceptance and celebration of your boys. Thank you for the link. 🙂 I love Annabelle’s video series too. Pingback: Ode to the Stim | Appalachian aspie.